Action from July's pre-season friendly between Burgess Hill Town and Haywards Heath Town at the Green Elephants Stadium. Picture by Grahame Lehkyj. A derby day clash could be on the cards after the Sussex Senior Cup semi-final draw paired local rivals Burgess Hill Town and Haywards Heath Town together. The Hillians take on National League South side Eastbourne Borough tomorrow (Tuesday) evening in a rearranged quarter-final tie after the game on January 22 was abandoned due to a floodlight failure. Victory over the Sports would see Hill and Heath meet at Lancing's Culver Road in the final four, with the fixture due to take place on Wednesday February 27 or Tuesday March 5. The other semi-final tie sees Bostik Premier side Bognor Regis Town take on Brighton & Hove Albion U23s or Eastbourne Town of the SCFL Premier Division. 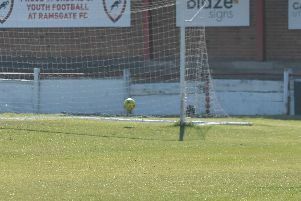 The original game between Town and the young Seagulls was controversially rescheduled by the Sussex FA due to fixture congestion for Albion's youth teams. Haywards Heath's run to the semis saw them pick up a famous away win over League Two Crawley Town, as well as victories over Little Common and East Preston. Burgess Hill have so far overcome Bexhill United and Pagham in the competition to reach the quarters. Kick-off at the Green Elephants Stadium for the game between the Hillians and Eastbourne Borough is at 7:30pm.